At the time I was still living in Edinburgh, and I knew that I wanted to make something different for my last Samhuinn before I moved to London, so I settled for drawing some sketches and getting on with making Hati the Wolf. A while after I moved down, I happened upon some abandoned plasting plumbing pipe, and got to work on my earlier idea. I made the basic shape of the head out of a single pipe – a sphere with a great beaky nose, eyeholes and extra curves to hold the shape of the face, stuck together with gaffer tape. 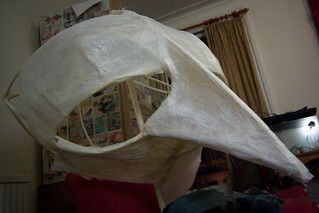 Then I cut out shapes from soft, thin packing foam to curve around the head, between the piping. 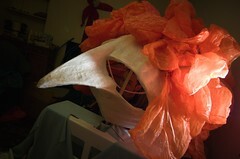 That gave me something to stick tissue paper to, and soon the skull had skin. It took me a while to work out how exactly I was going to do the hair, but once I hit on the idea of using Sainsbury’s bags, it seemed completely obvious. 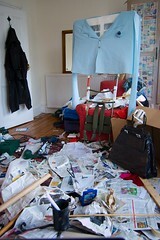 I advertised on FreeCycle, and found several people with surprisingly large collections of the things. I worked out that you can attach plastic bags to each other, or to many other things, by threading them through their own handles, so I just needed a crude frame to hold them all in place. For the body I took some polystyrene that a fridge had come wrapped in, and a baby-blue fleece blanket from a house I was cleaning out for some friends. 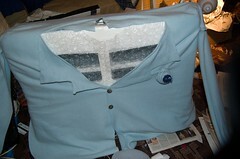 With about six cuts, the blanket had lapels. My friend Farah – a fashion design student – came over and finished it off for me by sewing on sleeves and buttons, plus a rosette made out of blue fluff from the tumble dryer with a few scraps of the fleece. And googly eyes. At the same time, my friend Sarah made a handbag out of a bin-liner and some cardboard, with rolled-up newspaper wrapped in gaffer tape for the handles and tin-foil clasps. 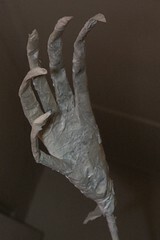 To make a hand to hold it, I took more rolled-up newspaper, stuck it together with masking tape, bent it to give it knuckles, and then shoved an old coathanger through the middle finger so that it could bear weight. The other hand didn’t even need the wire, since it didn’t have to hold anything. 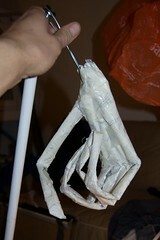 The arms I made out of cardboard tubes joined by interlocking half-loops of wire. 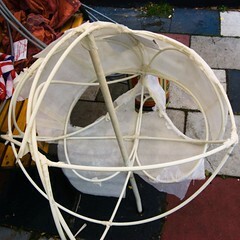 The actual weight-bearing structure of the puppet was almost the last thing I made, though I acquired the necessary rucksack-frame near the start of the process. I bolted a couple of hollow metal poles to the frame, and attached the folding wooden parts of an old laundry basket to them, and then I attached the large plastic spinal tube to that. The neck-pole rested inside the spinal tube, allowing the whole head to rotate 360 degrees. 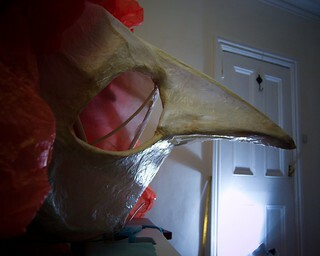 During the year or so that I was sporadically working on the puppet, I would occasionally tell people about the project, and they’d inevitably ask what it was for. I would tell them that I didn’t really have any particular occasion in mind, but I did know that in the event of her death, there would be a street party the following Saturday, and it would seem a shame to miss it. Around mid-March, I got to the stage where I knew I could finish it in a couple of days if the occasion arose, and on the Monday the 8th of April, Margaret Thatcher died in her bed at the Ritz. With help from the aforementioned friends I got the puppet finished up in good time, then I arranged some helpers for the day of the party. Five of us set out to get the bus into town, each carrying one or more components of the puppet. The driver of the first bus turned us away, but there was another 134 due in just a couple of minutes, and that one let us on. In the shelter beneath Centrepoint we met my brother and another friend, who had had the idea of making a coffin with the word ‘SOCIETY’ picked out in flowers. 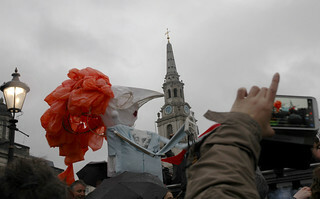 Together we assembled the various parts, and with the pack strapped to my back and someone operating each arm, we processed through the rain towards Trafalgar Square, coffin in tow, trying not to let Thatcher’s head smack into any street signs or theatre awnings on the way. We arrived at the party at about 6:30, to a round of applause from the thousands-strong crowd. As I explained to various journalists, I saw this as a chance to start laying Thatcher to rest, and for people to air their lasting anger and disgust with her legacy. I like to think that now she’s gone, we can focus on the fact that there really is such a thing as society, despite her best efforts to undermine it; greed turns out to have been dreadful all along; and there are alternatives to the money-addled neoliberalism that our unrepresentative democracy has stuck us with. There is a lot to fight for, but the world is changing fast, and I see reason to hope. As for my effigy of her ghost… I’m afraid it didn’t make it through the night, but here are some photos, here is some news coverage and here are some videos. thks time i am reading this impressive informative post here at my house.